There have been toys and games since before there were people; even young chimpanzees carry around wooden sticks and pretend they are babies. Many very simple games are also very old, like running races and playing tag or leapfrog, circle dances, seesaws, or competing to see who can jump the highest or the farthest, or throw a stone the farthest. Cat’s cradle games with string probably go back as far as string does, to the Paleolithic, before the first people left Africa. 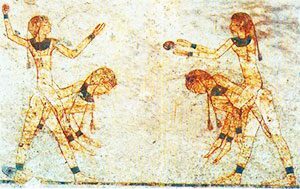 Tossing balls also goes back at least to ancient Egypt. People made balls out of leather stuffed with cloth scraps or wool, sewn together with leather thongs or string. Boys in Athens played a game like field hockey with curved sticks and a ball. 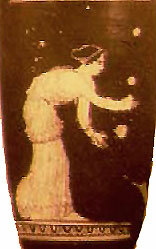 Girls juggled in ancient Egypt, and also in ancient Greece. Hopscotch seems to have started out as a training exercise for the Roman army, but it soon spread to Africa and all across Asia. By this time, and possibly much earlier, people also played marbles, first maybe with pebbles, then with small balls made out of clay (the crummy ones) and out of real marble (the good ones). (Glass marbles were not invented until much later. It is still possible, though not easy, to buy clay marbles, but I have not found a source for stone ones). Again we don’t know the rules. But probably they played the same basic games of marbles that we know today: one version where you take turns tossing the marbles at a goal (another marble, a hole, or a wall), and another version where you take turns shooting the marbles within a circle drawn in the dirt, trying to get them out of the circle. 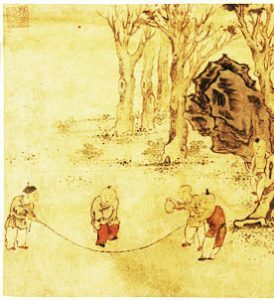 Children jumped rope in Song Dynasty China (about 1100 AD) and in medieval Europe just a little later. 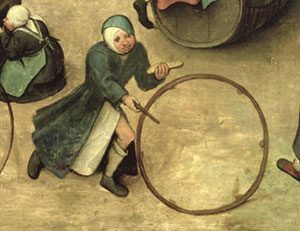 Another type of game was played with wooden hoops and sticks, either tossing the hoop up in the air and trying to keep it up in the air with the sticks (rather like a hula hoop), or rolling the hoop along the ground pushing it with the stick. Cite this page: Carr, K.E. What kind of games did people play? History of games. Quatr.us Study Guides, June 23, 2017. Web. April 22, 2019.